LOS ANGELES (AP) _ Andre Agassi certainly didn't show his age, or sign of back trouble. The 35-year-old Agassi won his fourth Los Angeles title and avenged a loss by defeating Gilles Muller in straight sets Sunday. Coming back from a two-month layoff because of a chronic sciatic nerve problem, Agassi downed the young left-hander from Luxembourg 6-4, 7-5 in the Mercedes-Benz Cup final. "It feels amazing. These moments don't happen very often any more and I'm taking it in,'' Agassi said after winning for the first time in almost a year. "It's great to let my game fly and to be eager to scamper after shots you're not even sure you're going to get,'' he said. He obviously was relieved that the nerve injury is better. Muller said he was too excited, too anxious late in the second set and Agassi took advantage. "He takes the ball early and makes you run. When he's in shape, he's one of the best players in the world,'' said Muller, who also said that Agassi was one of his heroes as a youth. 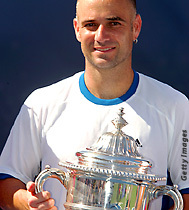 Although the field was depleted by upsets and withdrawals, Agassi capped an impressive run through the tournament that he also won in 1998, 2001 and 2002. He was playing for the first time since losing in the opening round of the French Open in May after aggravating the nerve injury. He also missed Wimbledon for the second consecutive year. Patient against Muller, Agassi came back from 40-love in the 11th game of the second set to finally break Muller, just the second break of the match. Agassi went on to hold serve to win the match, finishing it with a powerful forehand that Muller had no chance of reaching. The four-time Los Angeles champion beamed and thrust his arms into the air, then bowed and blew kisses to the cheering crowd. During the ceremony following the match, Agassi joked about taking the watch awarded to him and selling it on the Internet. He wished he hadn't. "That was a dumb thing to say all the way around,'' Agassi said, shaking his head. "Nine out of 10 times I say something, I'm glad I said it. One out of 10, I go, `Haven't you learned yet to keep your mouth shut?' That was one of those times. The top-seeded Agassi is ranked No. 6, while Muller is No. 75, the first player from Luxembourg to break into the top 100. Agassi's toughest test, and lone three-set match, was a 6-2, 4-6, 6-4 quarterfinals victory over former top 10 player Paradorn Srichaphan.